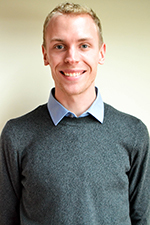 Reese Butterfuss, a PhD candidate in the psychological foundations of education program and a member of the Reading + Language Lab, has been awarded the 2019 Richard C. Anderson Graduate Student Research Award by the National Consortium for Instruction and Cognition (NCIC) at this year’s Annual Conference. NCIC is an organization whose mission is to mentor students and future scholars, as well as to conduct and disseminate educational research. Each year, the Richard C. Anderson Graduate Student Research Award is given to one student with a first-authored NCIC or AERA presentation. Butterfuss—under the mentorship of faculty member Panayiota (Pani) Kendeou—conducts research on reader-level and text-level factors that promote knowledge revision during reading. He has published several papers in this area. Read more about his work on executive functions (EFs) and reading comprehension here. In addition to this award, Butterfuss previously received the Graduate Student Research Excellence Award from the American Educational Research Association (Division C), the Outstanding Student Paper Award (OSPA) from the Society for Text and Discourse, and the Research Excellence Award from the psych foundations program in 2017. Butterfuss is currently a Graduate Research Assistant on the TeLCI project, funded by the Institute of Education Sciences. In his role on the project, Butterfuss, along with Britta Bresina, are leading the investigation on the role of executive function in young children’s inference making.